The name might not be familiar, but there’s a good chance you have enjoyed Hassan Ziadi’s cooking before. His professional resume includes work at many top Twin Cities restaurants, ranging from Un Deux Trois and Vincent A Restaurant to the Loring Pasta Bar and Sanctuary – as well as stints in Marrakesh and Doha. But you probably haven’t experienced what this talented chef can do with the cuisine of his native Morocco. 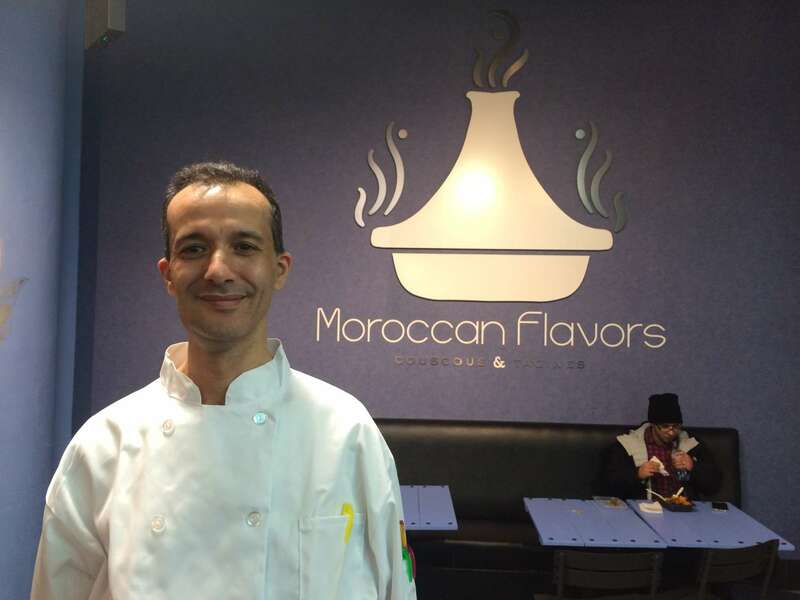 At his new Moroccan Flavors food stall inside the Midtown Global Markets, Ziadi and his wife, Samlali Raja, who is also a trained chef, offer a sampling of Moroccan cuisine’s greatest hits, including couscous, tagines, sandwiches and traditional sweets. It’s a limited menu, but Ziadi plans to expand it, and to offer daily specials such as b’stilla (chicken and almonds in filo dough), and briouat, samosa-like pastries filled with meat and cheese. You can find some similar dishes on the menu at Barbary Fig in St. Paul, owned by Algerian-born chef Moussa Brahim, and a few Moroccan-inspired tagines at Sameh Wadi’s Saffron restaurant (both recommended), but this is the first place to focus on Moroccan cuisine. Morocco was once a French colony, and the culinary influences run both ways. You can find couscous and tagines everywhere in France, while baguettes and pommes frites are popular Moroccan fare. At Moroccan Flavors, the kofta sandwich (spiced ground beef with a tomato and red onion relish) is served on a crusty baguette, and the chicken tagine is served over fries. This is no frills dining; you order at the counter: everything on the menu is under $10, and it’s all dished up in recyclable or compostable containers. I’ve enjoyed everything I’ve sampled so far. The flavors are fresh; seasoning is lively but not aggressively spicy. The Mediterranean sampler lets you pick two, three or four dishes from a selection that includes grilled eggplant, marinated peppers, roasted beets and spicy cauliflower. The couscous and tagines are offered with a choice of beef or chicken; a vegetarian couscous is also available. While the couscous dishes have the traditional garnish of carrots, cabbage and chickpeas, the tagines offer more complex flavorings – the chicken tagine is accompanied by preserved lemon and olives, the beef by an apricot, prune and almond compote. Dessert choices include orange slices with rosewater, and a variety of very sweet Moroccan cookies and pastries. Wash it all down with mint tea, hot or iced. The backstory: Ziadi met his wife, Samlala Raja, who is also from Morocco, when they were both working in Doha. When their daughter was born, they decided that Minnesota was where they wanted to raise a family. They moved back to the Twin Cities, and Ziadi signed up for an entrepreneurship training program offered through the Neighborhood Development Center, which manages the Midtown Global Market. When the former Sonora Grill space became available, Ziadi was selected to take over the space. It’s a small space, but Ziadi has big ambitions – eventually, he wants to follow the trajectory of the Sonora Grill and open a full-service restaurant, freeing up the MGM space for the next aspiring restaurateur.